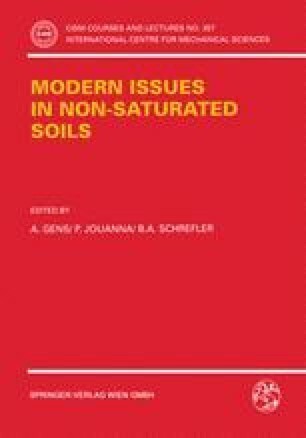 Theoretical and computational aspects of finite strain static and dynamic behaviour of fully and partially saturated soils are dealt with in this chapter. In the numerical model developed, pressure in the gaseous phase remains equal to the external ambient pressure and soil may yield according to a generalized plasticity theory. Several examples are shown, covering both slow phenomena and dynamic analysis. A comparison between one and two phase flow models in partially saturated soil behaviour is also shown in the case of slow phenomena.